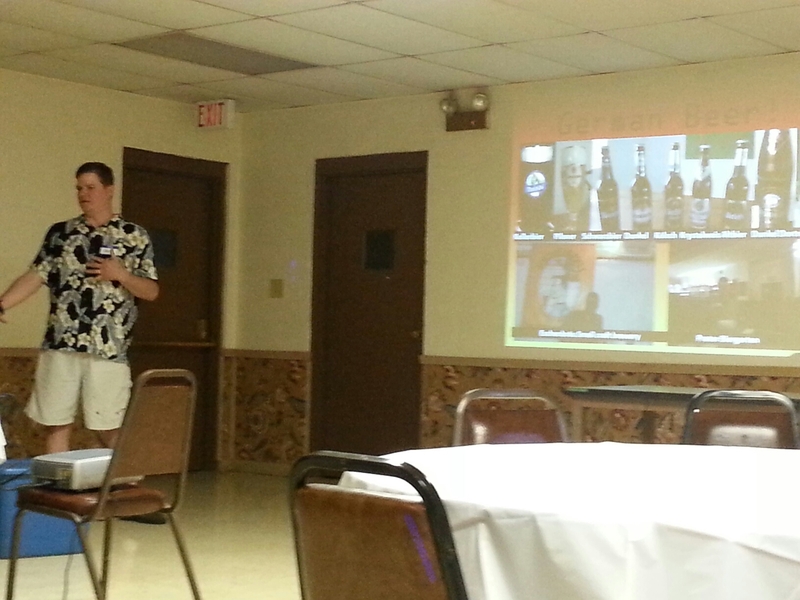 Last night was my second meeting at the local homebrew club Saaz Akron. This was an excellent meeting. Where else can you go to show off your beer and get critiqued, but then to have another few dozen beers to sample? It’s honestly better than going and getting a sampler at the Acme or the Mustard Seed. I had a excellent Christmas Ale (yes, Christmas in June) from Richard and Michael. They also had a Strong Ale too and provided homemade sourdough bread and sausage – thanks guys! Also at my table was a gentleman with a Vienna Lager that just placed 2nd at the Ohio State Fair. That was a good beer, very malty. There were two Altbier styles, both yummy though distinct. Mike Yingling (who generally cleans up at competitions) had several to try, most notably a chocolate coffee peanut butter stout. VERY chocolaty. VERY good. I also had a black IPA from a member. Very good. One thing that was mentioned that I found ironic in this craft beer environment that seems to produce many overly hopped beers, that there were HARDLY ANY pale ales or IPA’s made by club members for tasting. People just didn’t seem to be making them. Interesting that’s all. I brought a growler of the pilsner that was just made and the peach Hefeweizan. People seemed to like the peach a lot. There was some great shop talk. There is a member that I have to get in touch with and talk more on yeast culturing – something I have wanted to do to save money but just a little short on time. There was a presentation on member’s homebrew systems. There is a lot of ingenuity amongst brewers. And from the quality of the beers I tasted, you can make great beer on virtually any type of system, from some cobbled-together pots and pans, to a full-tiered system. Discussion on German beer pubs and breweries.